#102715 - Our Thickest Diecut Tag! 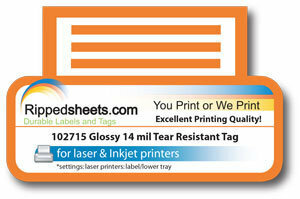 Our 14 mil Photo Gloss, Tear Resistant C1S Tag is our thickest tag material that can be diecut in any shape or size in our 48 hour Short Run Production Facility. This is a premium photo gloss coated on one side and will print on both inkjet and laser printers on that one side only. Its smooth coating accommodates high resolution printing and offers a true photo quality product that rivals offset printing. This material is tear resistant, so tag holes and cut outs, slits, and perfs work while resisting tearing.